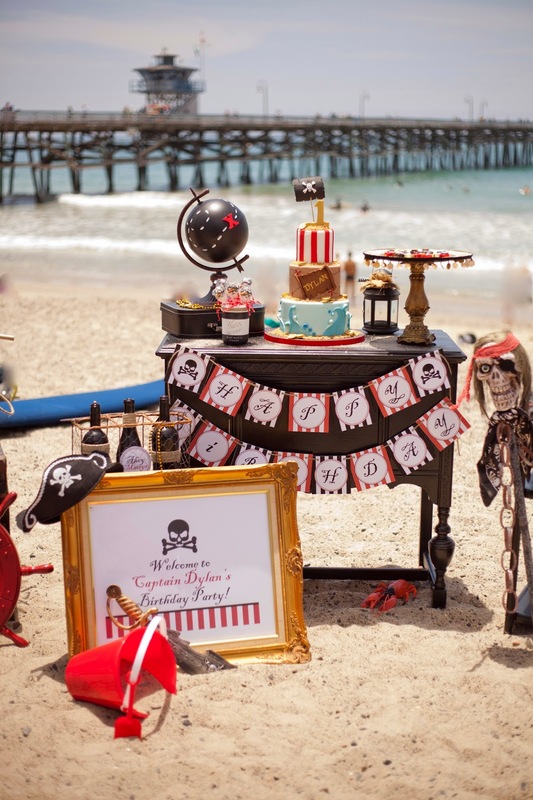 Pirate party on the beach! 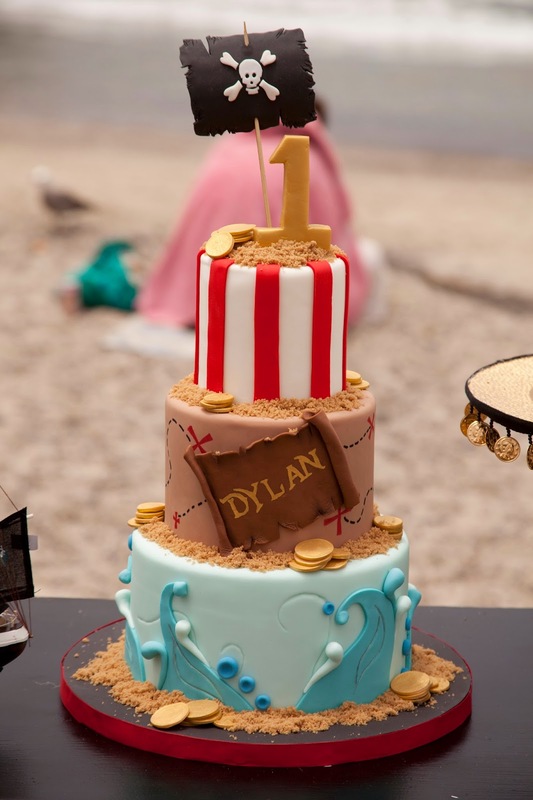 I couldn't wait to celebrate our little man Dylan's 1st birthday! 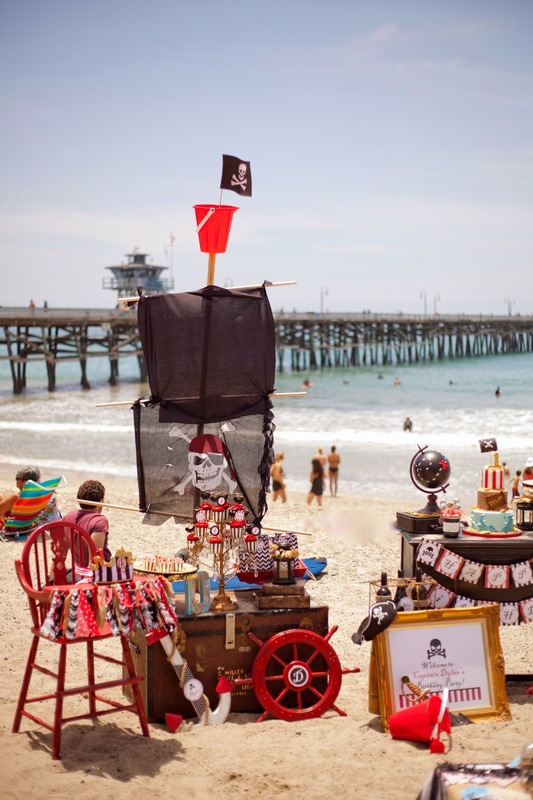 I've always wanted to create a pirate themed party, and with our vacation taking place in San Clemente, a pirate party on the beach just made sense! I really wanted to go BIG with my little guy's party. After all, 1st birthday parties are kind of a big deal! And this would be my last, 1st birthday party, for any of my kiddos. I created a few simple DIY projects for the party; something I really love to do! 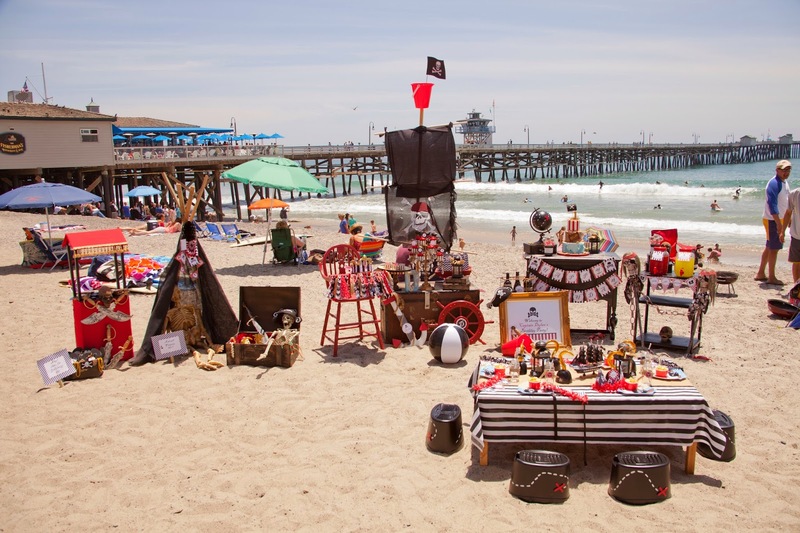 My projects included: a pirate teepee, a ship’s mast, a sword shack, and painted car wash buckets! 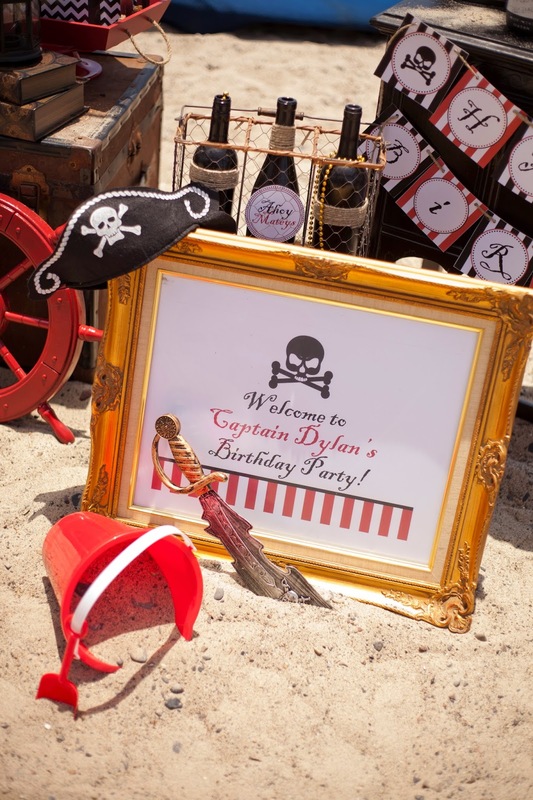 For Captain Dylan's Pirate party, we made sure each little pirate guest was treated to lots of pirate themed favors and accessories. 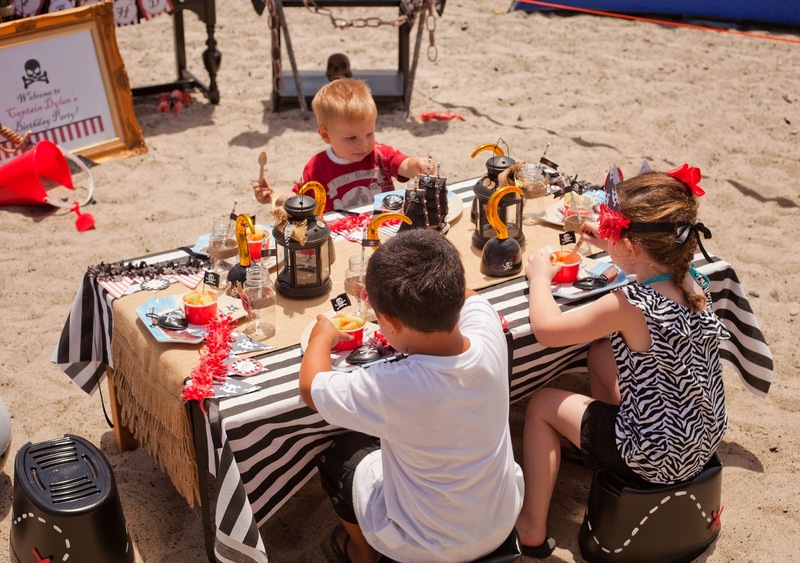 First stop for the guests was the pirate station. 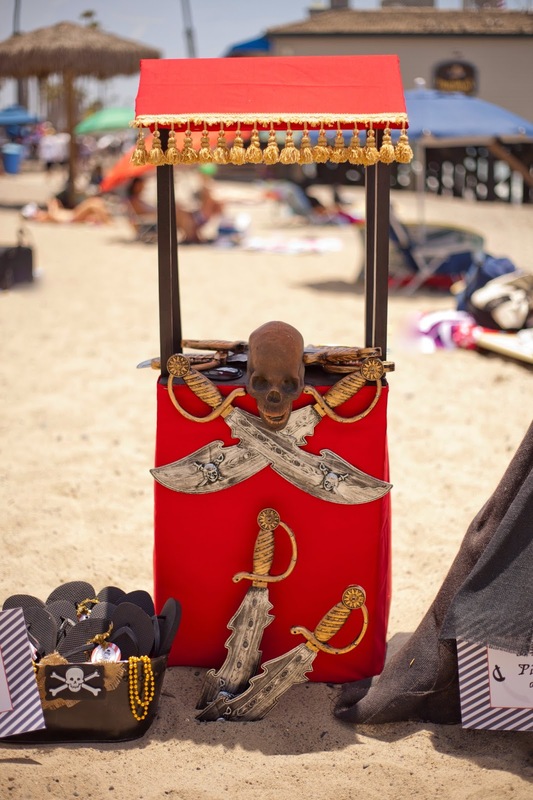 We set out swords, eye patches, and flip-flops. The pirate swords came from Oriental Trading. They came in a package of 12 and were very sturdy. 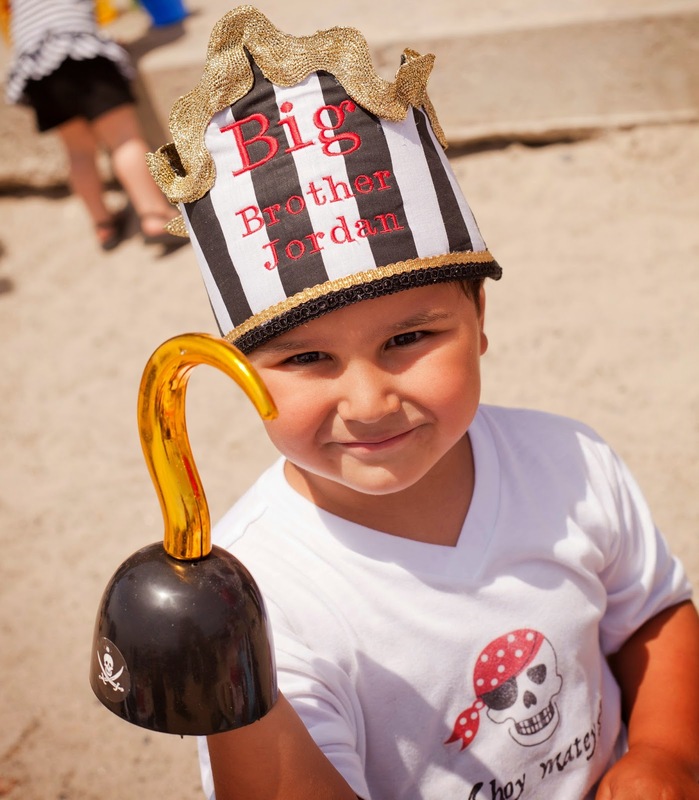 They provided LOTS of fun for our swashbucklers! 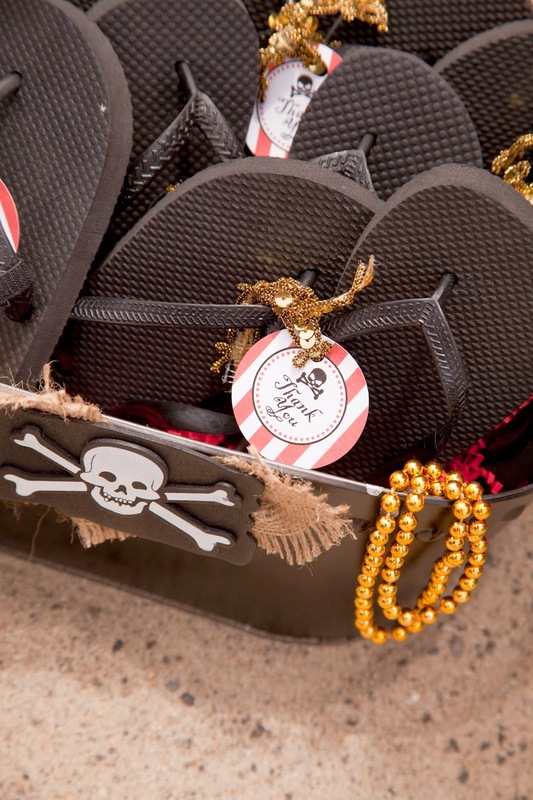 All the party guests got to grab their own pair of flip-flops. They were perfect for the beach! I arranged with all the parents before the party to make sure that I got everyone's correct size. I painted a wooden high chair for the birthday boy, and added the most beautiful, personalized, handmade garland, from Lilly Paul Designs. It was made from burlap, skull fabric, and pompoms. This is something we’ll treasure & use for years to come! 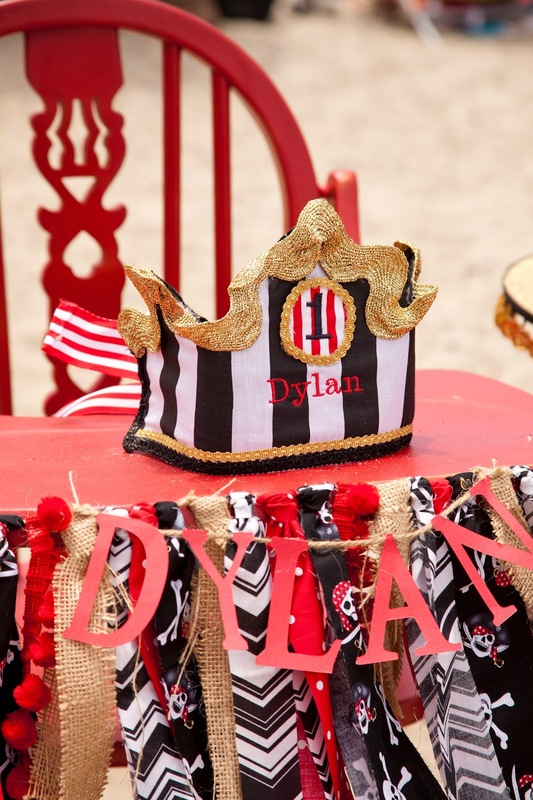 One of my favorite touches for this pirate party were the handmade birthday crowns! They were so beautifully crafted! No birthday child should go without one. 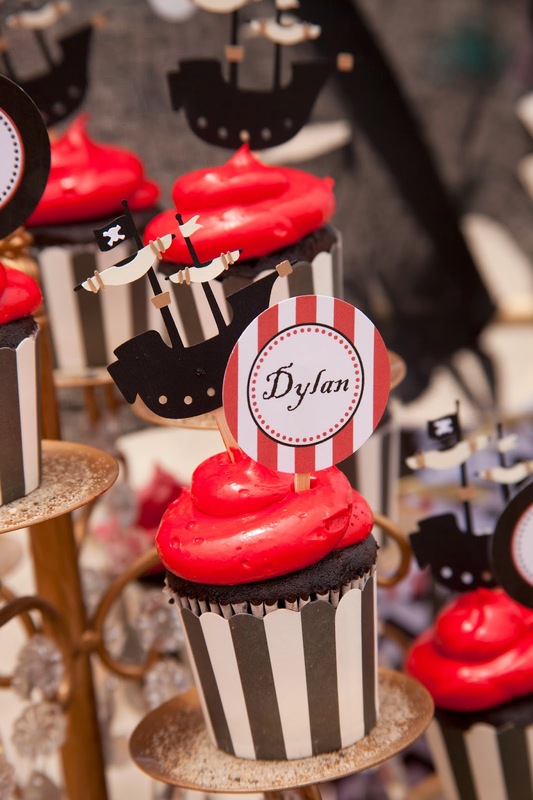 My talented friend Shawna, of Shawna Brockmeier Events, creates each one with love. And it was just perfect that the birthday boys' big brother got to feel included on this special day. He also got his very own birthday crown! 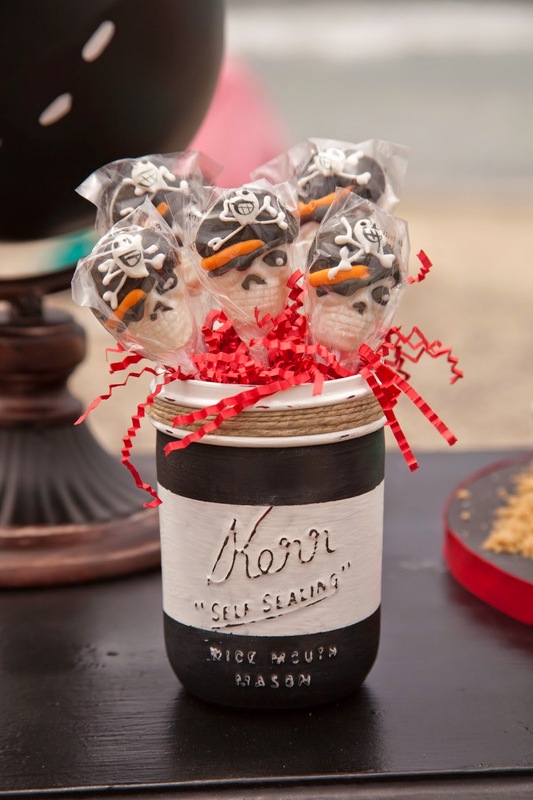 Other fun elements were the hand painted Mason jars! 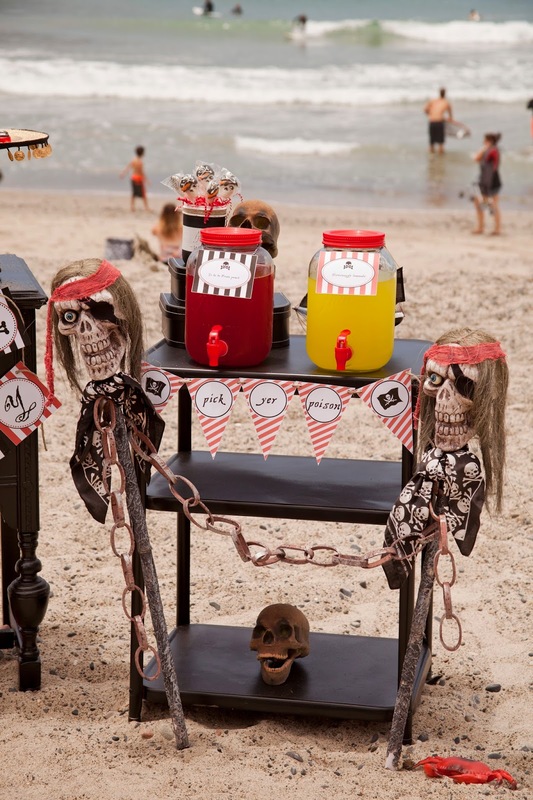 Decorated with stripes, and twine, they held our pirate skull lollipops, perfectly. 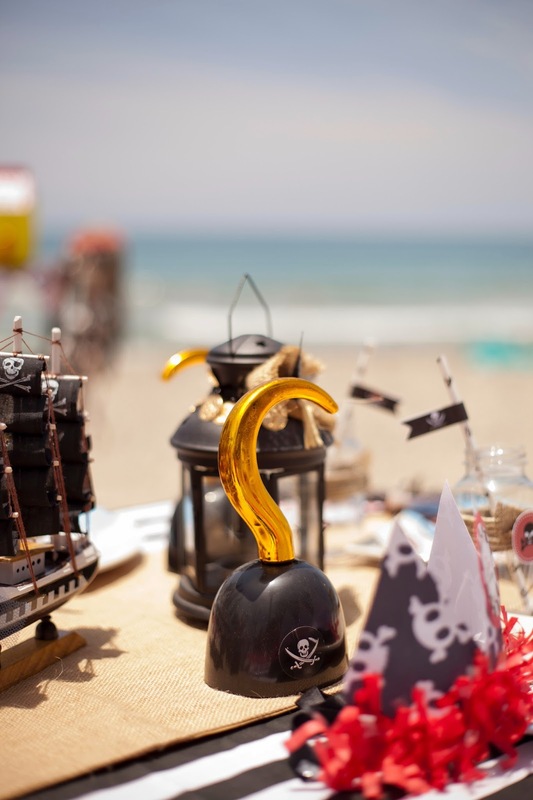 The pirate suckers were purchased from Oriental Trading. I was so pleased with the quality! They were packaged nicely, vibrant in color, and tasted delicious. 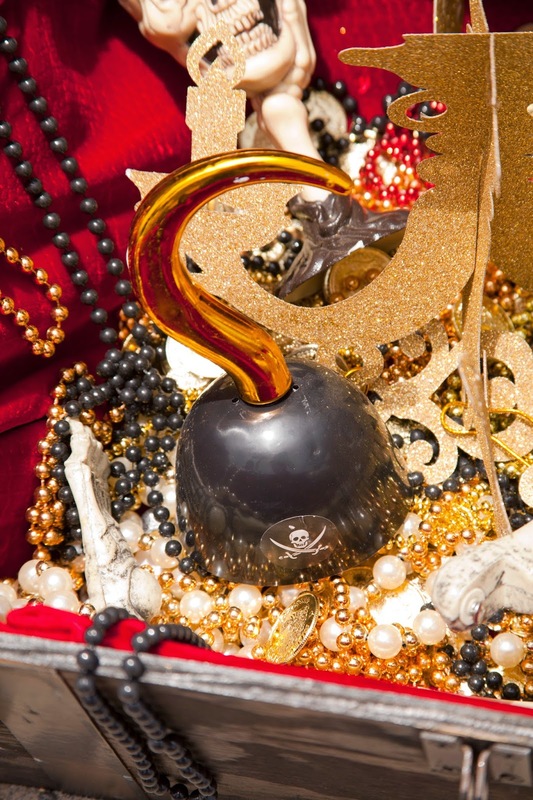 I found this black globe at HomeGoods, and gave it a little pirate party makeover. 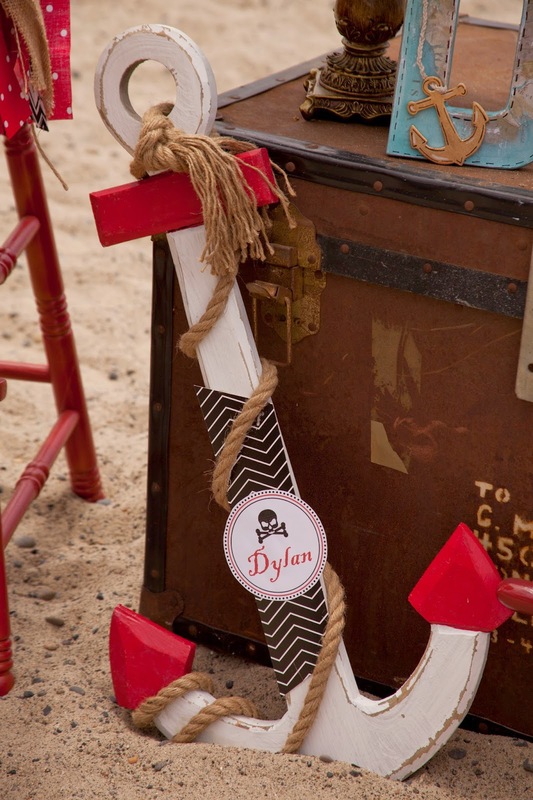 I painted a white map trail, and added a red X.
Tancy's Creations made this darling letter "D" for Dylan. 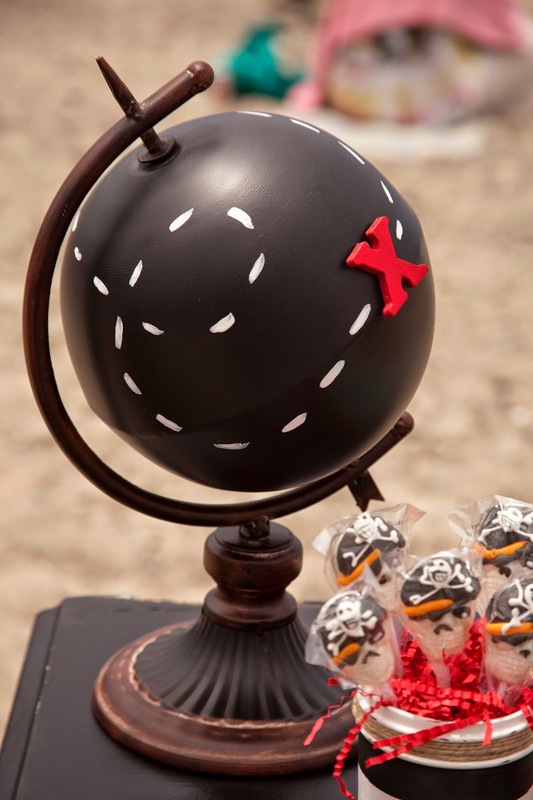 It was decorated so sweetly with a map background, and a cute little anchor that was connected with rope. 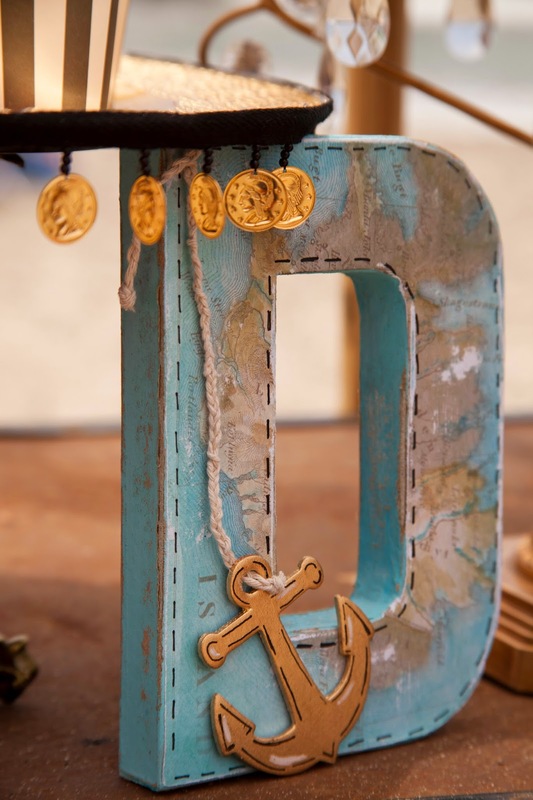 I just fell in love with all the handmade decor from so many fabulous vendors. They added so much cuteness, and a wonderful personal touch that we treasured! We couldn't have asked for a more beautiful setting! The weather at the beach was gorgeous. I just love how the photographer Maria captured this view. 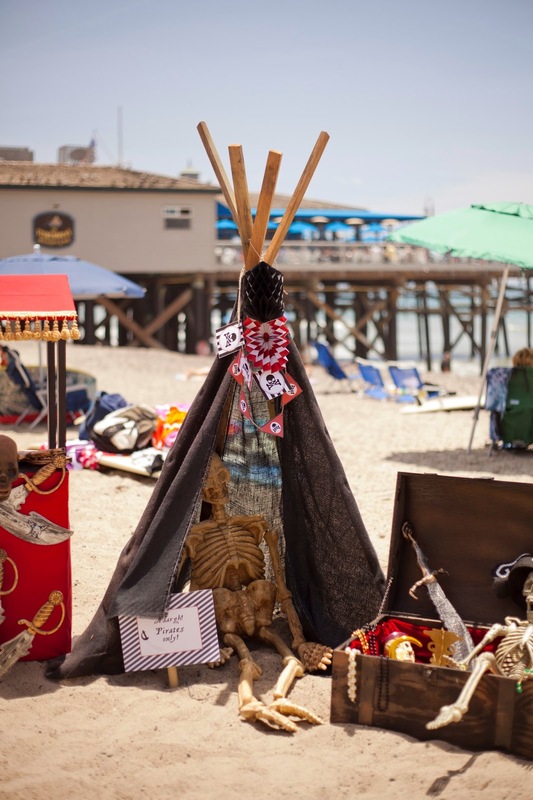 The San Clemente pier looks amazing in this shot! We constructed a ship's mast with dowels from Home Depot, screws, a beach pail, black fabric, and a cool Pirate's flag from Oriental Trading. The flag was a bit bigger than I expected, and was the perfect addition to our party. It arrived perfectly frayed, and had the right amount of wear & tear. The mast rested perfectly behind an old, weathered trunk that I found it at a flee market for $20! I added a few decorative items to sit on top, and completed the look with an anchor, and ship's wheel - both found at Home Goods. I constructed this teepee with lumber from Home Depot, and black burlap found at Walmart. It was fit for a pirate, don't you think? I added printables from TomKat studio's set, and strung them on the outside. The treasure chest was filled with all kinds of good stuff! Jewels, gold coins, gold chandeliers, and gold necklaces - all from Oriental Trading. Their chandeliers were really fun! Easily assembly, and they even came with a little chain & hook for hanging. I had a lot of fun setting up the kid's party table! I got to add lots of little details that made our party really fun. I took little wooden spoons, and stamped them with pirate lingo. Little cups of fruit kept hungry tummies happy before it was time to feast. 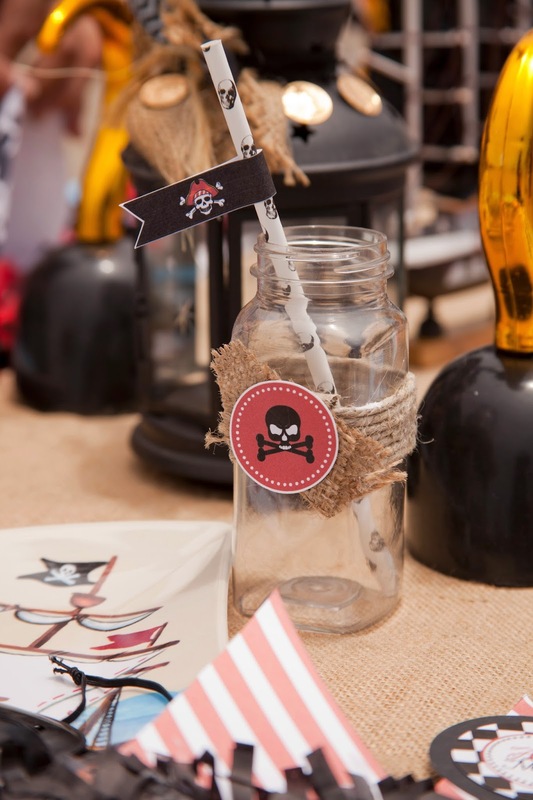 I embellished plastic milk bottles with twine, pieces of burlap, and pirate printables. I then added some cool paper straws that had skulls on them. I found the pirate themed straw flags from a free download on Oriental Trading's site. The kids ate on plates that were shaped like pirate ships. 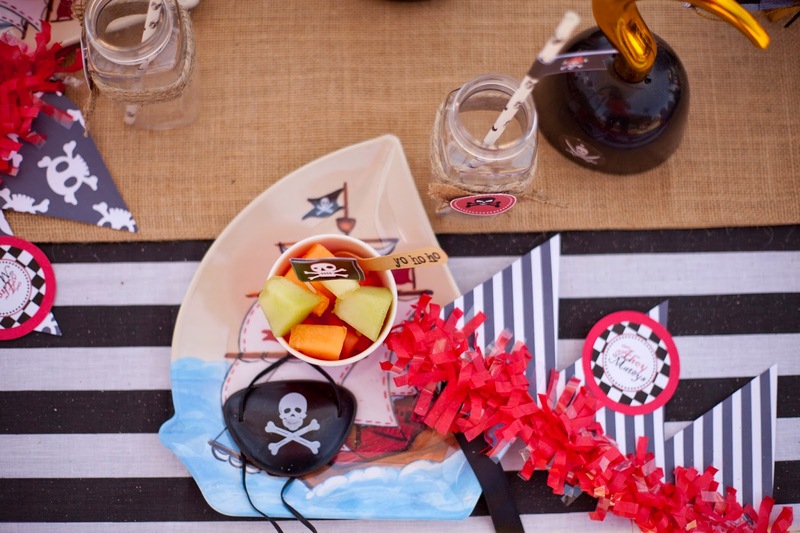 We served the kids gold coin nuggets, sweet corn on the cob, and mini cups of fruit. 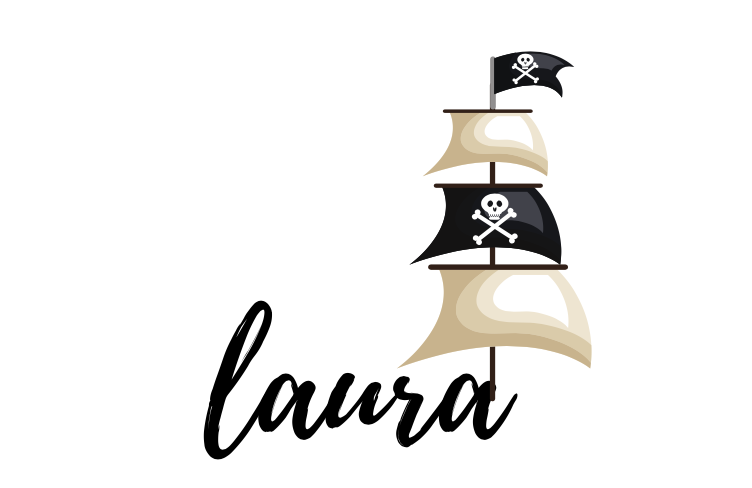 I created paper crowns for the little pirates, with a free template found on The TomKat Studios site. I traced the template onto printable paper from mygrafico.com and added some red paper fringe. I completed the crown with a party circle from the printable set, and ribbon on the sides to tie it. 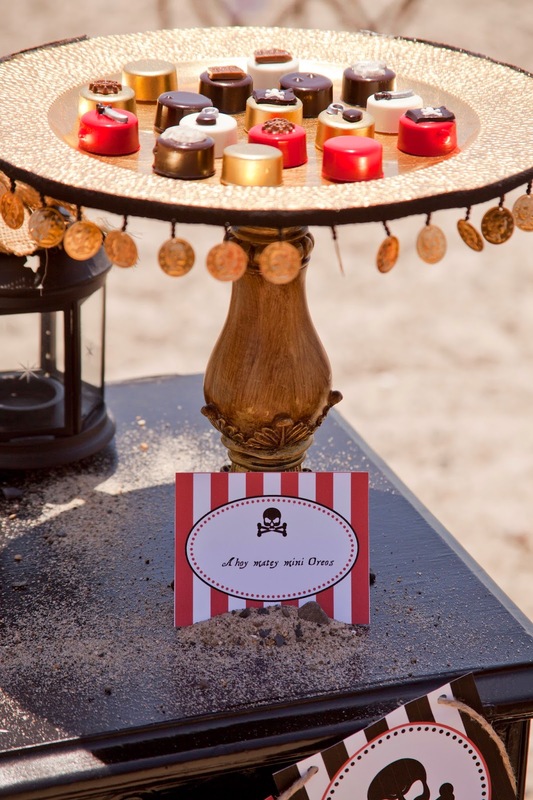 Embellished Ikea lanterns, and a mini pirate ship were set out on top of a burlap runner. 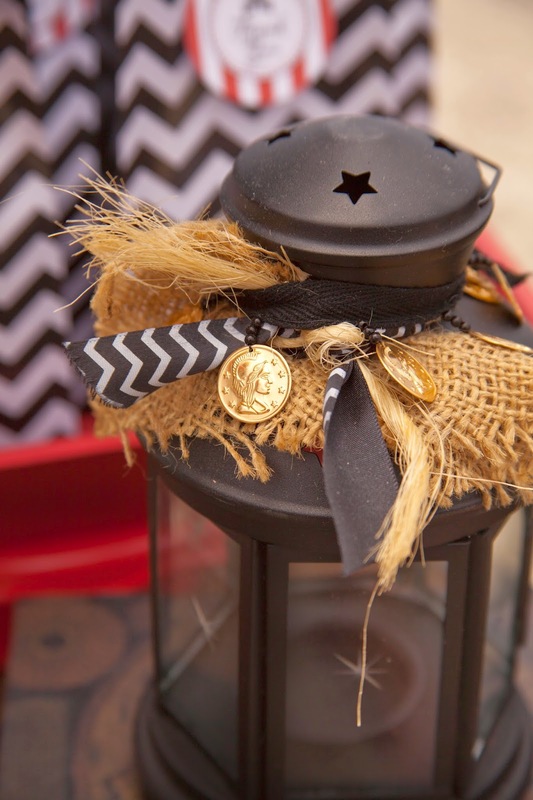 I took a plain black lantern from IKEA and tied burlap, twine, and chevron ribbon. I also found some really neat ribbon that had mini gold coins attached. I bought a couple yards, and finished off each lantern with it. 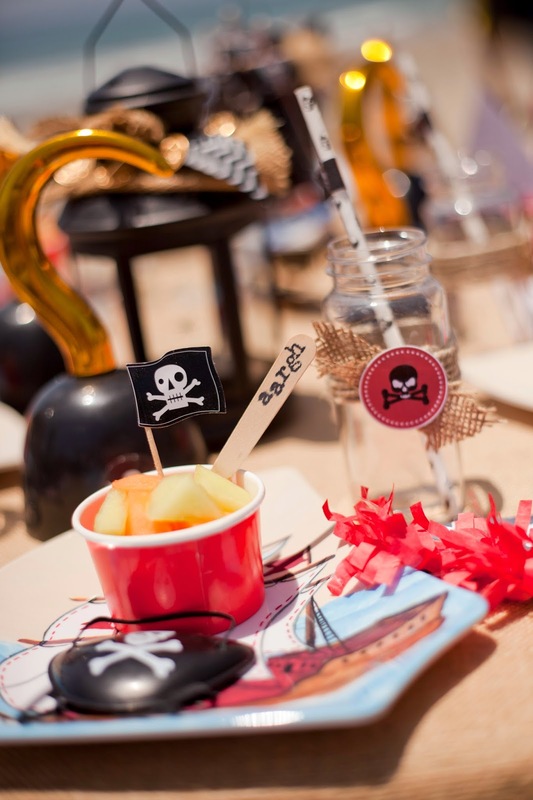 The table scape included eye patches, and pirate hooks, for each guest. 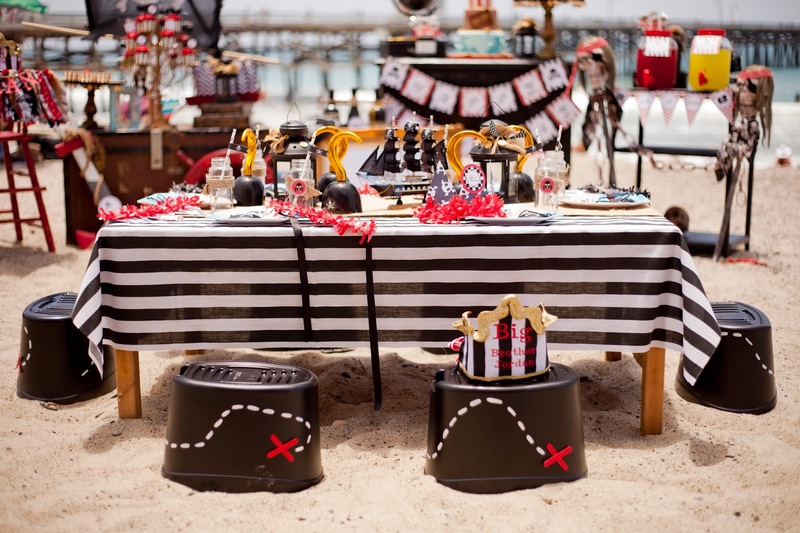 They guests enjoyed a feast fit for little pirates. 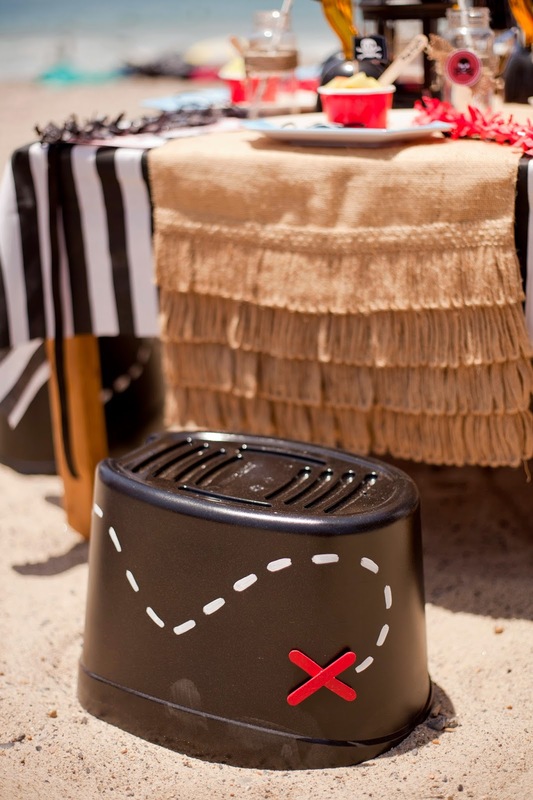 One of the challenges of hosting our party on the beach, was finding inexpensive seating for all the little party guests. 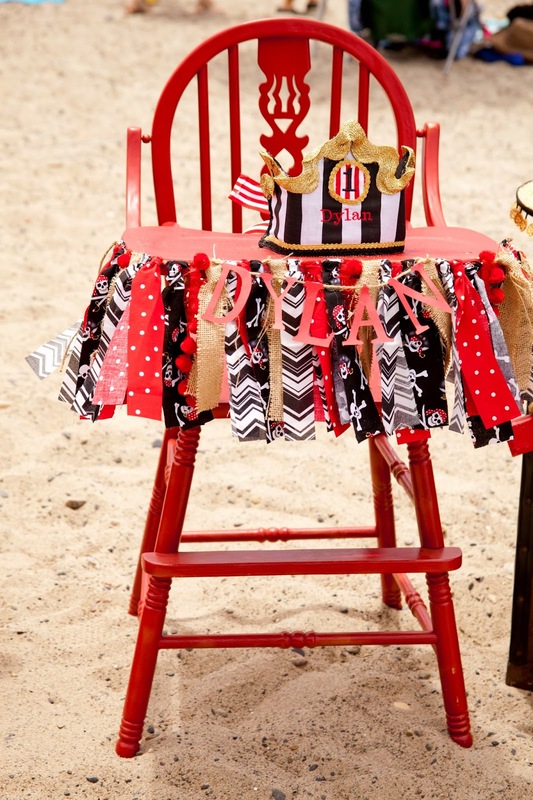 Being out of town, and on the beach, I didn't want to deal with renting any chairs, but I still wanted everything to coordinate. I got a crazy idea in my head to use buckets for seating! I found some blue car wash buckets at Walmart, and used black Rustoleum spray paint, and sprayed each bucket. Once they dried, I painted a white dotted map trail, made red X's with mini popsicle sticks, and hot glued them to each bucket. Perfect! 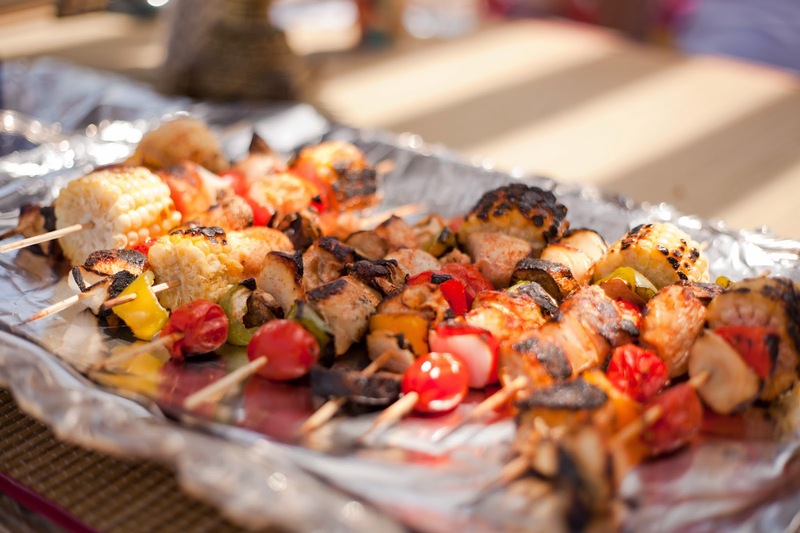 The adults feasted on chicken & veggie kabobs, kale salad, and beans. 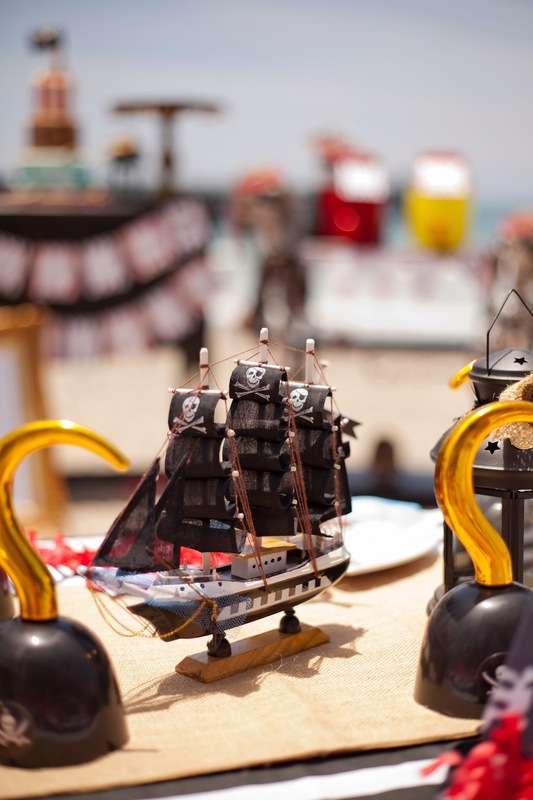 It was truly a delicious feast, fit for hungry pirates & scalawags! I loved the "Happy Birthday" banner from The TomKat studio's printable set. I attached it with twine, and it brought out all the fun colors of the cake table. 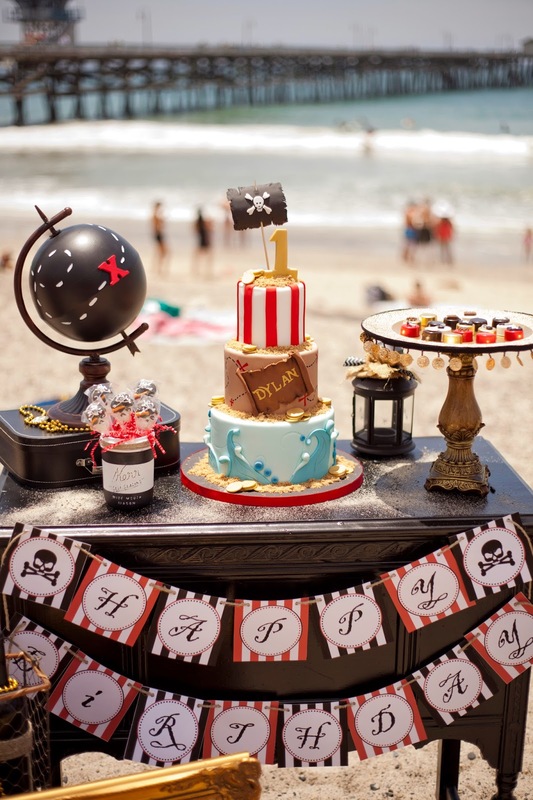 My little guy’s 3-tiered pirate cake was nothing less than spectacular! The detail, and love that was put into it, was just amazing. Not to mention, delicious! We also had yummy mini oreo cookies that had the most detailed treasure maps, swords, and hooks that I’ve ever seen! 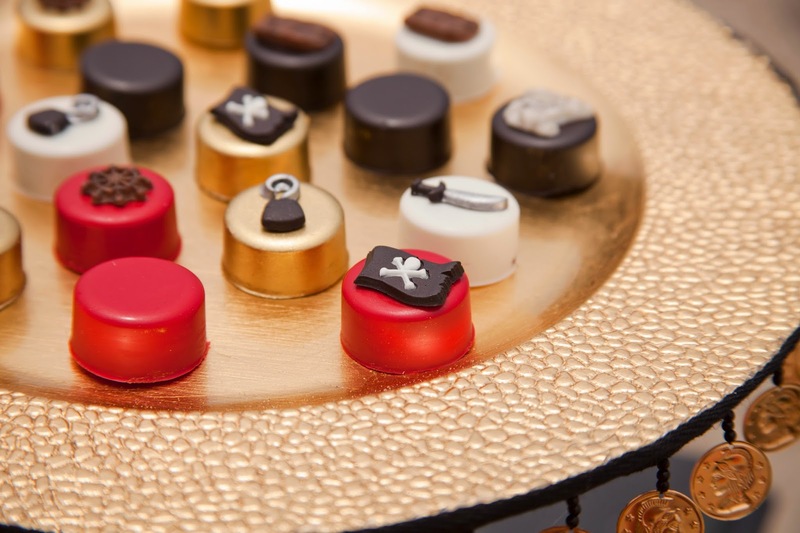 Bella's Bakery & Bowtique always creates the most beautiful desserts! 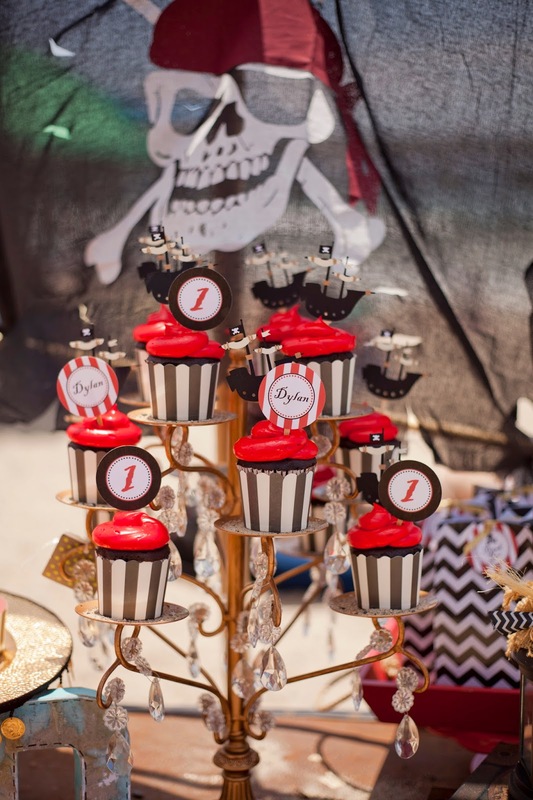 We served cupcakes and added them to a gold cupcake tower, with hanging jewels! 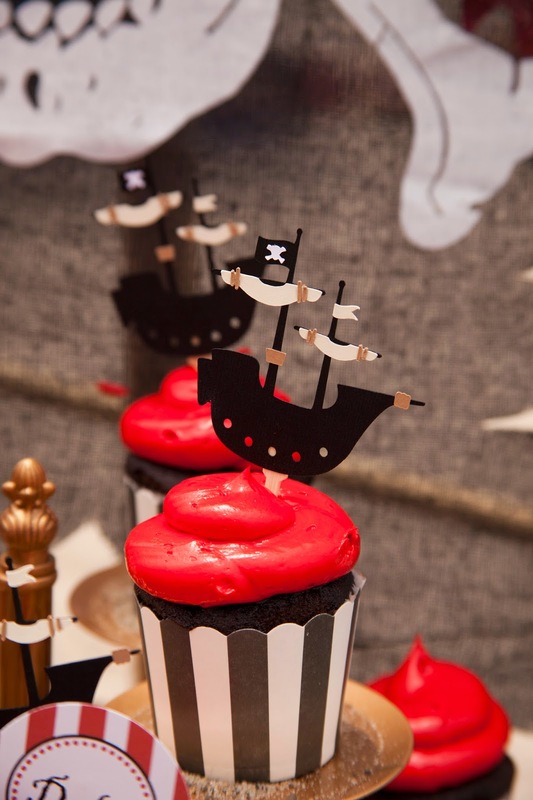 The little teeny-weeny paper details that Creativities Galore put into their pirate ship cupcake toppers were just amazing. I also added printable circles to some of the cupcakes. The guests couldn't keep their hands off of them! 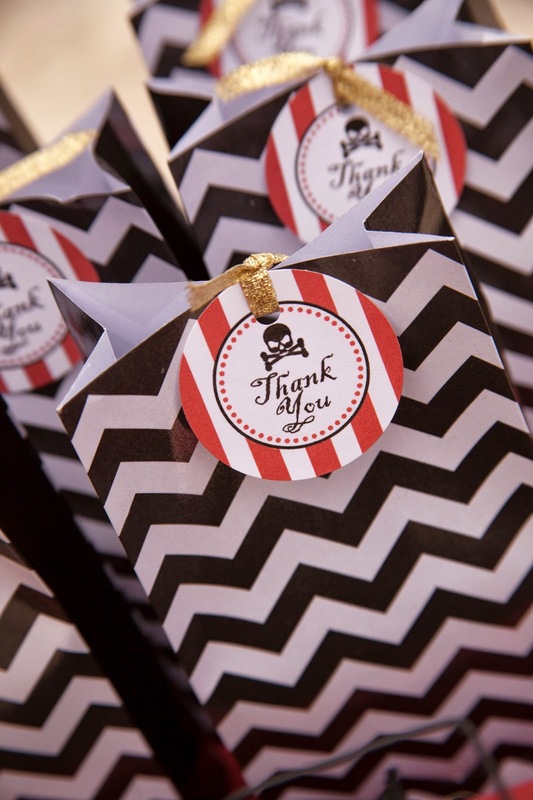 At the end of the party, the guests got to take home swords, eye patches, and chevron goody bags that were filled with bubbles, ring pops, and other “treasures”. 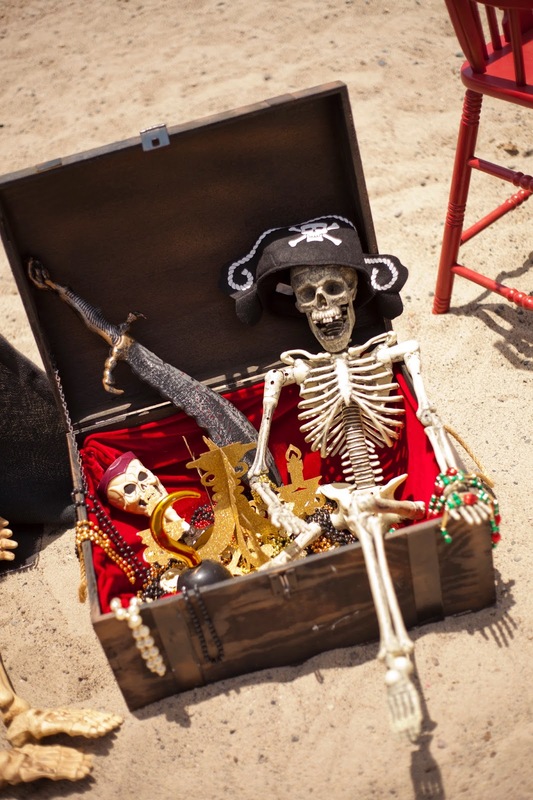 And to help keep all their pirate’s booty in one spot, they carried everything home in their bucket seats! Happy 1st Birthday, sweet Dylan! We love you so very much!